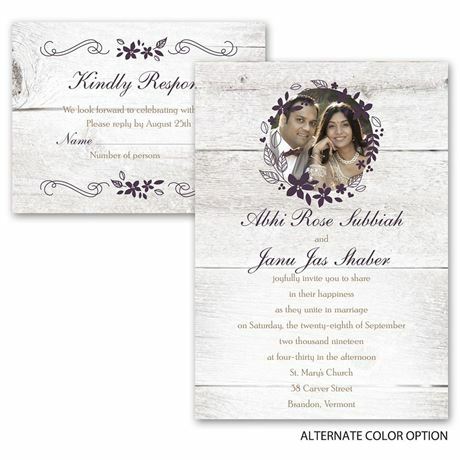 The rustic woodgrain background featured on these all in one wedding invitations is given a charming feminine touch with pretty floral accents framing your photo and wording. 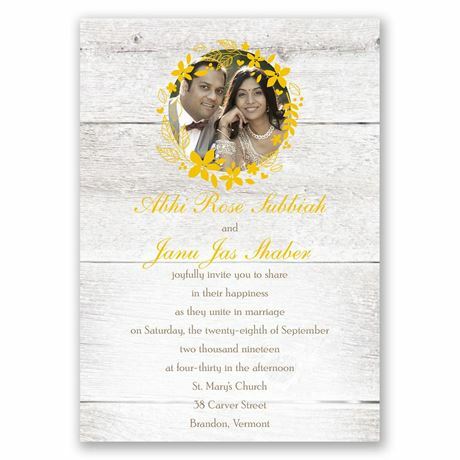 These two-sided invitations are printed with your photo and invitation wording on the front and your choice of wording on the back (reception and accommodations details shown). Matching response postcards are included in the price. Due to the unique printing process required to offer you this invitation and its coordinating pieces at a lower cost, you will personalize the invitation and response card together; however, you will receive the pieces separated. Floral design and your wording are printed in your choice of colors and fonts. Inner and outer envelopes are included with these all in one wedding invitations. Personalization Options: Background prints as shown. Design and wording are printed in your choice of colors and fonts. Your choice of photo. Please Note: Due to the unique printing process required to offer you this invitation and its coordinating pieces at a lower cost, you will personalize the invitation and response card together; however, you will receive the pieces separated. Response cards are included. I purchased these for my wedding and they couldn’t be more perfect! The company chatted with me and answered all of my questions very quickly. The invitations were delivered in a few days are stunning! I can’t wait to send them out!